When Shattering Performance Limits Makes You Think You Have Broken Your New Detector! The last few months have been some of the most rewarding ever throughout my time at EDAX. In the last year or more we’ve been working on a series of new detector technology offerings, which we can now finally bring to our customers. These detector advancements are quite literally shattering past performance limits. And it’s not just one technology, but a combination of three technologies together which makes the Octane Elite launch one of the most exciting of my 20 year career here. Two months ago, I sat at the system generating data that would give us an idea of the performance specifications that we could associate with the product promotion as we went to launch. I had just achieved a never before reached input count rate of 2 million counts per second, but was slightly hesitant to promote that, since it’s variable based on SEM conditions and sample. So, I let it sit for a bit and we went into a stellar M&M show with a strong set of performance specs from low energy performance to grid materials and spectral resolutions at high speeds. Following the show, we had a webinar planned, which again focused on those performance limits. It’s been one of my goals this year to be very data-driven, using direct examples to let a story show itself, so a crucial piece of the webinar was to collect the applied examples that illustrate the specs, and this made a great opportunity to revisit the 2 MCPS data collection. Being efficient (much like our detectors!) I like to try to use one sample to tell multiple stories, so I grabbed a favorite ductile iron sample, which has both carbon for low energy performance and iron for high speed mapping. My first notable point was that I could run the count rate up to 750 K CPS input with max output at 60% deadtime and still obtain an excellent carbon peak in a spectrum extracted from a map (Figure 1). At these high count rates, older technology detectors cannot maintain this type of performance, and we’ve even seen carbon dropping off at 500 K CPS, our previous best, which was also an industry high. And by dropping off, I really do mean that the spectrum will no longer show a carbon peak as the spectrum no longer displays the peak at all, or in some cases, a highly distorted peak with little differentiation from the background. So, by achieving a carbon map at one and a half times the highest count rate ever achieved before, I felt I really shattered previous limits. I didn’t stop there, but pushed the count rate up to 1.5 M CPS input and still was able to detect the carbon peak, albeit with some degradation in the quality of the spectrum. Figure 1 shows a clear display of the quality low energy performance even extracted extracted from a high speed map collected at 750 KCPS. But why stop there? As I was already ramping up the count rate, I figured I’d continue as far as I could, and I opened the aperture all the way on our thermal FEG. At this point, I was running our SEM at 20 kV and max aperture, which would mean a beam current at or above 100 nA. This is really not an achievement in itself, since most all thermal FEGs can get there, and this SEM is 15 years old, so it’s not a new type of achievement. The steel sample was conductive, of course, making it suitable for this condition, but it was mounted in a non-conductive mount, so I had it grounded simply with carbon tape. Once I opened the aperture, I had to do a double take at the CPS since that was a lot of numbers, and I actually counted to make sure I had it right – we were at 2.8 M CPS input! The reason I had a hard time believing this is that normally at that count rate, the detector would saturate and this time it did not. I was certain at that moment that I had broken our new detector and what I was seeing must be noise, because even just getting those counts without the detector turning off is a feat. So, of course I had to collect data to see what the quality was. And while the dead time was high at >90%, I was still able to collect a phase map (Figure 2) where both the low energy elements and higher energy steel were solved by the phase map routine in just a few passes. These detectors have a great many additional performance enhancements with the Silicon Nitride window, vacuum encapsulation and CUBE electronics, but this example serves as a good display of the payoff of all combined, and this work would not be possible without the benefits of all of these aspects together. To also address the windowless comments that I’ve gotten since my webinar, in summary, that’s an altogether different product. Our Octane Elite is a mainstream, general purpose detector that has all of these performance benefits, while the windowless serves more of a niche set of applications. I’ve had a windowless detector in my lab for years now and I’ll be very honest, it sits unused on a bench and I only mount it when I have a special requirement. My detector of choice, given my unlimited detector options, is absolutely the Octane Elite. Figure 2 shows the highest x-ray map ever collected at EDAX at 2.8 million counts per second at 20 kV with the Octane Elite detector technology. 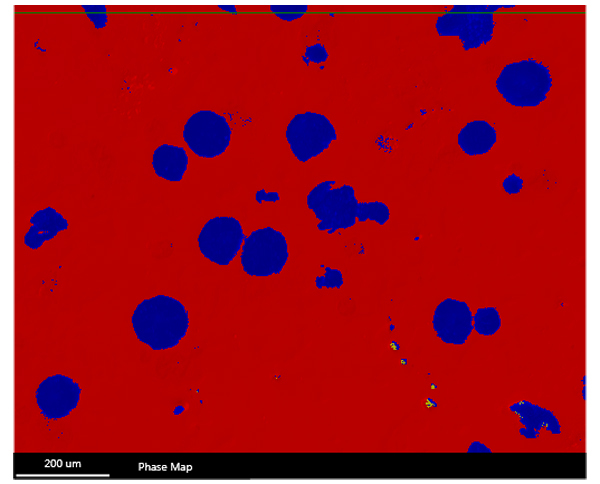 Steel matrix is shown in red and graphite nodules are blue. On a side note – we’re currently looking to fill an EBSD apps position in our NJ lab, and as I describe the job to potential candidates, I’m always drawn to some of the real highlights that an applications position offers someone in the technology field. I hope this blog today captures it perfectly. As an apps person, we bridge the area between commercial and development, or customer and engineering. In fact, it’s even part of our mission statement that the applications group understands the real world customer needs and translates them into the product development process at EDAX for our future products. This in turn, strengthens our products and services to meet the most important needs, those of our customers and those that further the technology into groundbreaking directions like this never before achieved detector performance. 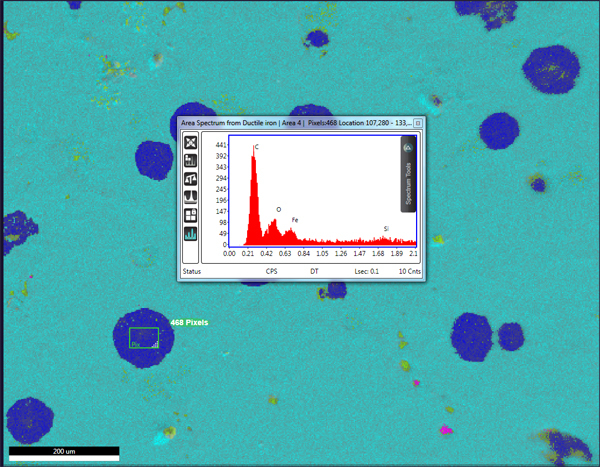 ← XRF – Mile High Style!